February 19, 2014, 4:37 PM · The 2014 Menuhin Competition begins on Friday in Austin, Texas, with an opening concert that will feature 2012 Junior Division winner Kevin Zhu, who will play Waxman's "Carmen Fantasy." The concert also will feature The University of Texas Symphony Orchestra with Gerhardt Zimmermann conducting; and performances by violinist and jury member Ilya Gringolts, violinist Olivier Charlier and pianist Anton Nel. Kevin, who is 13 and lives in the San Francisco area, took some time earlier this month to talk to me over the phone about the appeal of classical music, about fine violins, and about his experience at the last Menuhin Competition, when he won First Prize in Beijing. Kevin began playing the violin when he was just three years old. "I was extremely interested in it, from the first day that I heard the sound of a violin," Kevin said. When Kevin was a toddler, his father used to play Chinese folk songs in the living room for Kevin and his sister. That's when his father noticed Kevin's keen interest in the instrument. "But when he tried to hand the violin to me, I actually stumbled back, because I was scared of the thing. It was about the same size as me, at the time! Then when he gave it back to my sister to play (he was teaching my sister at the time), I crawled back right to where I was and started listening again. Then when he tried to give it to me I stumbled back, and that kind of went back and forth." Before his first real violin (a 1/16-size), Kevin had a little plastic, white toy violin, which he carried around the house with him. Kevin entered his first competition at age five and soon after started taking from Li Lin, his currrent teacher. "I actually do enjoy the competitions, although it can be a lot of pressure," he said. "But it's fun to meet new people. Overall it's just a great experience, to see all these other amazing violinists competing as well. You can learn a lot from them, too." Kevin, 13, attends a public school, Lawson Middle School in Cupertino, Calif., where he is in eighth grade and enjoys extra-curricular activities such as swimming and basketball -- in moderation. "Of course, you have to be careful, because if you hurt yourself, an injury definitely could have some impact on your performance on stage and whether or not you can perform in some concerts," he said. Playing such fine violins has "been a wonderful experience, just to hear their sound," he said. "It definitely gives you a lot of experience, because first of all you get to feel the different instruments and you get to adjust to how their response is different and how to adapt to those different responses quickly so that you can keep improving on a new instrument. It also teaches you something about almost the acoustics of the instrument, how different things can be." Kevin said he has some friends his age who like classical music, but only a few. "It's very rare to find young kids like me who actually enjoy classical music," he said. The world of pop music, with its techno-, dub-step and myriad new forms, is ever-changing. "It's almost ridiculous, how much music can change in a matter of a decade." And classical music? "Classical music has a lot more feeling to it than any other type of music," Kevin said. "To me, it can be inspiring. It can show anger, it can show love, it can show so many different types of emotions. It can do so much! It can basically portray an entire human being's emotions and strengths and weaknesses. And it's something that makes me calm; it puts me in a better mood if I'm not happy. It's not like pop music, where most of the music is fast-moving, with lots of different things going on at the same time, like 20 or so voices. I don't want to say classical music is necessarily more simple, because it's not -- but things are more elegant, more refined." 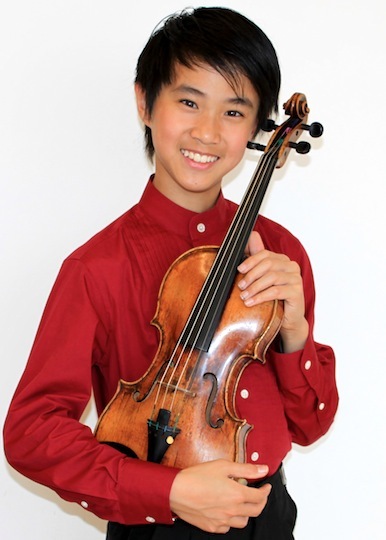 Since winning the Menuhin two years ago, Kevin has kept busy; in January he played the Prokofiev Violin Concerto No. 2 with the Saratoga (Calif.) Symphony, and he's been working on the Waxman "Carmen Fantasie," Elgar's "La Capricieuse," the three Gershwin/Heifetz Preludes, and the Wieniawski Polonaise in D Major. How much does he practice? "It varies every day. On a good day, without too much homework, I'll manage three or four hours," he said. "If I have a lot of homework, maybe two or three hours. On the weekends I have more time to practice, but I also go to the San Francisco Conservatory of Music, and driving there takes an hour each way. And I also do music composition class there, which is basically like music theory. That takes another two and a half hours. So on Saturdays I don't have too much extra time, so about three hours. Then Sunday I have a little more time, but I have to go to Chinese school, so, about four hours." Does he have a favorite violinist? "I don't really have any favorites -- you can learn from everyone," Kevin said. "Everyone has their different qualities, and you can take all of them and combine them to create a better product. I don't really have a favorite recording, because I'm listening to them all the time. There are so many out there, I can't even put my mind around it." As for his experience at the Menuhin Competition in Beijing in 2012, "the entire competition was so marvelous, so outstanding," he said. "The environment was, of course, competitive, but it was also so calm. It was just an enjoyment to listen to all these other young competitors -- you learn from them, especially at this kind of a level. You can even learn about your own playing."